In this paper, I will show an approach that lets WCF to have two implementations for a WCF service. The proposed approach provides the ability to switch among the service implementations at runtime. Last week, I work on a service oriented project that has two types of clients. Both of the types should be able to access the services on the server and both of the types should see the same interface on the server, but the services on the server should provide basic functionality for the clients in the first group (majority of the clients) and they should provide the complete functionality for the clients in the second group, (minority of the clients). Base on the logic behind the business, some of the clients in the first group have been upgraded to the second group and some time, some of the clients in the second group have been moved to the first group. However this solution is not convincing. The problem is the fact that the codes of the basic and complete implementations have been tight together strongly. The ideal is having two different implementations; a basic and complete implementations. Based on the Admin decision the server will use the basic or complete implementations. In the time that I seek for a solution, I find that the idea of having two implementations per WCF service can be useful in many other situations. Sometimes you want to change the implementation of your services but you want to keep the old services in case the new service gets problem. Sometimes your services interact with internet resources, but you want to have a local implementation of your services in case of losing internet connection. There are other situations that the idea would be useful too. At first glance, I thought it doesn't possible to have two implementations for each service, but thanks to the great WCF extensibility. WCF is a fantastic platform to build service-oriented applications in the .NET platform. One of the facts about the WCF is its ability to extend its functionality. Every part of the platform can be extended, and most of the default behaviors can be replaced. The problem is how we can have two implementations for each service. Studying the WCF concepts, I realized that the solution is related to a custom IInstanceProviders. In fact, using a custom InstanceProvider, a custom ServiceBehavior, and a new ServiceHostExtention, the whole scenario comes to life. Before delving into the detail, I will show you how to use the solution. Like any other WCF service, the first step is defining the interface of the WCF service. The DoWork method returns a string that contains the name of the service and the SwitchService method switches the service from one implementation to another. Here are two different implementations of the above interface. Now, the service has the capability to switch between its implementations. By calling the SwitchService method, the implementation of the service has been switched. For example, consider the following sample that is run on the client. As you can see, the first call of the client.DoWork has fired the method of the TestService class, but the second call of it fires the method of the BasicTestService. It is the result of calling the SwitchService between the two calls. I will demonstrate the code of the SwichtService later. The following class diagram displays the classes of the solution. In the above diagram, there are a custom IInstanceProvider, a ServiceBehavior and a ServiceHostExtention. The custom IInstanceProvider has been used to create service instances from the appropriate implementation. The ServiceHostExtention is used by the developers to announce the IInstanceProvider to switch from one implementation to another and the ServiceBehavior has been used to tight all of the things together. In the following sections I demonstrate the detail of each part. WCF infrastructure uses IInstanceProvider to create and release instances of WCF services whenever it is necessary. Here is the code of the IInstanceProvider. // The current System.ServiceModel.InstanceContext object. // A user-defined service object. // The message that triggered the creation of a service object. // The service's instance context. // The service object to be recycled. As can be seen in the code, the IInstanceProvider gets an IServiceFactory in its constructor. The ServiceFactory has two methods for creating the services; the first one creates an instance from the basic implementation and the second one creates an instance from the complete implementation. Here is the code of the IServiceFactory. The other thing that needs attention is communication between the user code and the IInstanceProvider. As can be seen in the code of the SwichEnabledInstanceProvider, there is a ServiceHost extention called SwichEnabledExtension. As you can see, the IInstanceProvider uses its UseBasicService to decide using which implementation of the service. 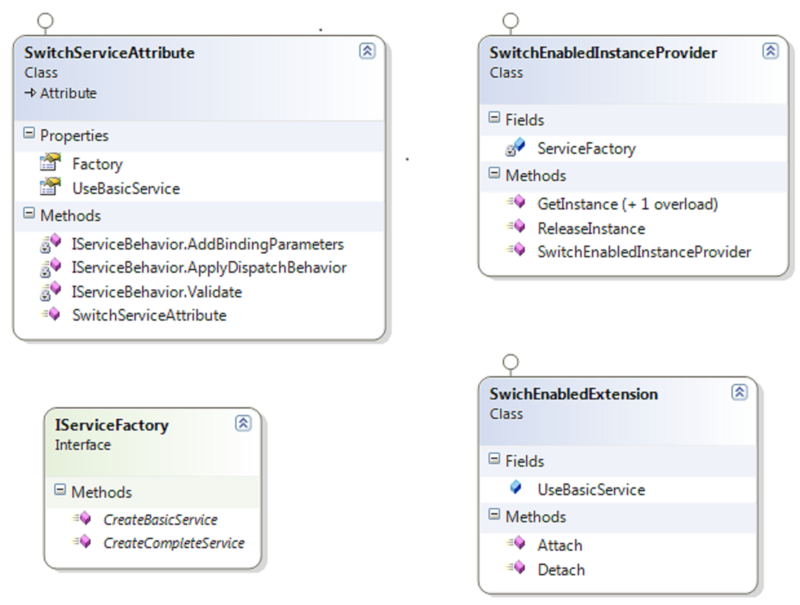 The SwichEnabledExtension class can be accessed in the code of the services to announce the InstanceProvider to change the service implementation. Here is the code of SwichEnabledExtension class. The above code gets the extension from the list of the Host extensions, then switches its flag and finally releases the current service. By releasing the current service, the SwichEnabledInstanceProvider uses the other implementation of the service in the next call of the service. // Assign it to DispatchBehavior in each endpoint. The code of the above classes, plus a demo can be downloaded from here. You need VS 2010 to run the sample.